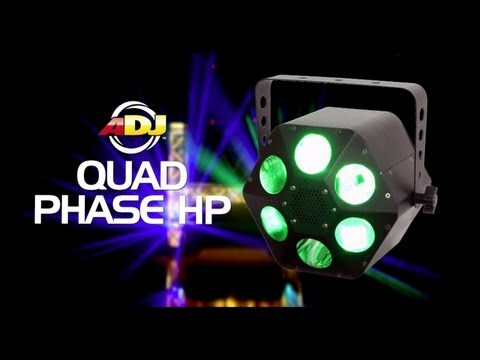 Considering purchasing the American DJ Quad Phase HP? Have questions? Ask people who've recently bought one. Do you own the American DJ Quad Phase HP? Why not write a review based on your experience with it. bought to replace my final old style halogen lamp disco light. This is robust bright and projects further than I thought it would the only fault if you call it a fault is on sound to light mode the mirrors inside do not always turn completely so some times you only get half of the colours/shapes but other than that its fine. One of the best room filler lights I have bought. Like how they have IEC in and out. Great all round lighting effect. Total room filler. Great effect, could do with the yellow colour in it but apart from that it is a great all rounder and I now own 4 of these. Loads of beams over a wide area which look fantastic with smoke. Great coverage for the money. These fill most of the room. I brought a pair of these. Great light amazing coverage and work well with a dmx cable. Looks really great, especially with smoke. Also great how it comes with a little remote to control all the settings. Really good little light unit, great effect even without smoke (although definitely better with smoke!) Although the glass lenses rattle which can get quite annoying! Light is brilliant for filling a room! looks excellent, fills the floor nicely. Ideal for small/medium set up. this is my second item and im totaly blown away to see them in pair with or without fog the lights are simply amazing. An excellent very bright pinpoint beams of multi colours. runs auto or sound active. This is a must for the start up Jock who wants impressive light show. A lot brighter than the older version and creates an amazing effect, especially with fog. But, this fixture is a lot louder in operation as the old Quad Phase. But when the music is going you can't hear it. Great fixture though, worth buying!! 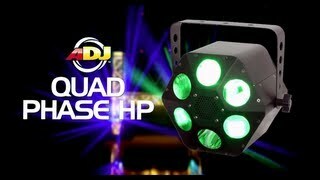 Purchased 2 American DJ Quad Phase HP to replace existing Party Bar lights as part of mobile DJ set up. Excellent produce, light in weight, easy to transport, easy to use, quick set up. I have used both my lights in recent event and they filled large room with ease and provided excellent lighting effect for the dance floor. Would recommend for mobile DJ's or house parties, excellent value for money. This is a big upgrade on the 10W versions. This light has some better bult in lighting shows when used as a pair, shower sharper beams than previous models, and is a far better light overall! Well worth the money, one of the best LED effects on the market today!! Seen a video for American DJ Quad Phase HP online or have you own video? Check out American DJ Quad Phase HP on DJkit.com!